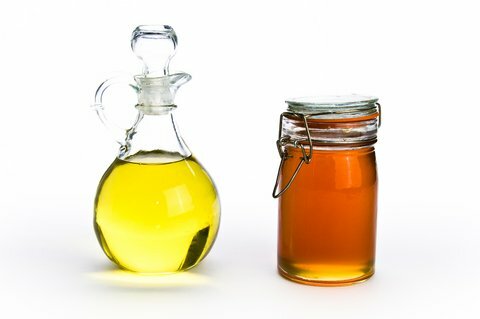 A honey and olive oil hair mask is a great way to treat dry and damaged hair at home. 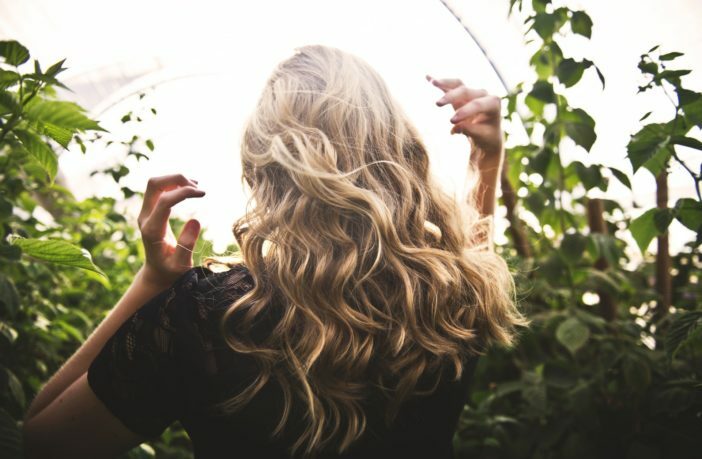 This is a simple two ingredient recipe for healthy, shiny hair. It works on all hair types, will NOT discolour your hair, and is easy to do. I’m pretty obsessive about my hair. As of right now, it’s down to my elbows and 100% my natural colour (which is an odd reddish-blonde that looks horribly dull indoors but lights up quite nicely in the sun). Not only do I skip the salon for dying my hair, I’ve also taken to cutting my own hair. I realize this isn’t for everyone. Some people can’t make peace with their natural hair colour or want to cover up grey. For others with short or complex hair styles, cutting your own hair might not be an option. However, some haircare tips are good for everyone so I thought I would share my most recent find. This is an amazing honey & olive oil hair mask that makes your hair shiny and beautiful. My hair is so ridiculously long & thick, I ended up making three batches of the honey & olive oil hair mask recipe before I could comb it all through. Yes, that’s a lot of food I put in my hair, but we all need to make sacrifices for beauty. Once my hair was full of honey and olive oil, I dipped the ends of my hair in olive oil only just to give them a bit extra moisture. I then wrapped my hair in a warm damp towel, waited one hour, then shampooed & conditioned, dried & styled as normal. Use a wide-toothed comb to make sure the moisture coats every strand. A narrow-toothed comb probably won’t be able to handle the honey and you won’t be able to brush it through. If you find you can’t comb the mixture through your hair, add more olive oil. It is better to add olive-oil to tips, or mid-shaft down of your hair. Olive oil is oily, so you don’t want to put this on your roots! Honey is made of sugar, which means it will dissolve in water. Your hair will feel VERY sticky, and that might make you worry a little, but the warm water in the shower will dissolve all the honey and wash it from your hair. This will NOT change your hair color, natural or dyed. It is just a moisturizing mask. You can do this once per month or once every two months. For moisture touch-ups in between treatments, simply apply some warm olive oil to your hair for 15-30mins then rinse. Sounds intriguing…. and scary! you promise my hair won’t turn into a sticky mess forever? Okay so I just did this to my hair and I can’t even begin to contemplate how well this really worked!!! My hair has been really dull lately, and my ends have been excruciatingly dry, but now my hair seriously looks like I just got it done. I have very dark hair and it tends to look dingy but it looks so healthy. I can’t stop running my fingers through it!!!! I just wanna know how often can I do this to my hair? Is once a week too much? I don’t think so! It’s just olive oil & honey so it’s all natural 😉 I do find that whatever I do to my hair, if I do it a lot my hair gets used to it. So this is why I always have to switch up shampoos or my routine. But I think once per week then down to every two weeks is probably perfect. Question can you use regular store bought honey or does it HAVE to be straight from like a hive honey??? Yes, I use store-bought honey. I have curly hair…not sure if stickiness will work….. I used it on my super curly hair and it worked beautifully! My hair came out so soft and shiny! Thanks for the great tip! I’ve started doing it once a week. I don’t even need to use regular conditioner anymore. I’m willing to try this but I’m worried about the cost of the olive oil versus like a V05 oil treatment. I have thick hair-it’s like a horses mane. Hmm I recently got a gallon of un-pasturized honey from some bee keepers down the road, think that would work? Absolutely!! In fact, most honey found in stores is so watered down it can’t even really be called 100% honey–despite the label. Plus, that kind of honey tastes soooo much better than anything from a store!!! I do this treatment all the time and love it! Also, if you have extra honey, you can use it as a facemask/facewash….its a little weird and sticky, but as soon as water hits it, it rinses off easily. I have used the V05 treatment before and it does work. I like the home made alternative though. Honey does sound scary! I do avocado once a month. ooh I’ve heard good things about avocado hair treatments! That’s how your hair is so beautiful! I guess guys could try this too? Maybe I’ll give it a shot. does your hair have to be freshly washed? I’m definetly going to try this!!!! It works really well! Enjoy! i cant wait to try it i just made it and i cant wait to see the results!!!! 🙂 thanks for the tip! It will brown a little but in the olive oil it should still be smooth! Does it have to be extra virgin? Not sure if I have extra virgin… just normal olive oil. Do you wash your hair first? No, only at the end to get the oil & honey out! I have naturally black hair (I am Indian). Would this treatment make my hair turn grey/white or any other shades? How many times can I safely use this mask per week? I did try it ones and love the smoothness of my hair. I would hate to discontinue because of change in colour! No, if you’re using natural/organic honey & olive oil there should be nothing in it to change the color of your hair! This reply is totally late but I just found this article! Honey CAN lighten hair, in fact some people use it for this purpose. That doesn’t mean that it WILL lighten your hair, but if you have concerns, I just wouldn’t use this mask too often and you should be fine. It’s not going to turn your hair grey or white or anything, though! Can I substitute the towel for a shower cap? My parents are a little iffy on me using a towel. Yeah I just use a towel! It works great. No, just makes it shiny! Great idea, but instead of pepermint oil I use 100% coconut oil. it smells great and also helps your hair grow as well. Three days a week I leave coconut oil in my hair as a leave in conditioner over night.. it helps with dry, dull, damaged hair!! Do i apply this to wet or dry hair?? I put it on damp hair. Could you use vegetable oil? My hairs are very thin… can i still use this…!!! I tried doing this but I could not comb my hair after application. It was super sticky. And no matter how much mix it honey still gets separated from olive oil. What did I do wrong? You have to wash your hair with shampoo afterwards. Ofcourse I did shampoo my hair after applying. but I am talking about the case while application. You mentioned in your blog that you were able to comb your hair through after applying. I wanted to ask how you did that when the hair is really sticky. Anyways It really worked well. My hair is so moisturized after that. Awesome results. That happened to me too. I’m also wondering how to comb it through when it’s on. I ended up heating more oil separately plus spraying it with more water to comb it through. At first, I was scared out of my wits putting honey in my hair. It was an absolute sticky mess, and I couldn’t get the comb to go through my hair. But, after a long hour of trial and error, I finally managed to cover my hair in the mask, and wrapped it in the towel. After taking a shower and blow drying my hair, I didn’t really see a change in the texture of my hair. But, I woke up the next morning, and I stood in front of the mirror in amazement. I have never had hair this shiny, tangle-free and strong in my entire life. Thank you so much for this mask recipe. I will be using it regularly. Was your hair dry or wet when you applied it? Is this on damp or dry hair? Either. I’ve tried both. Damp is a little easier to work the mixture through, but dry let’s me know I’ve covered every strand. hi my name is Rosina and I just saw your blog, but I would like to know if this would help me with loosing so much hair. Do you apply it wet or dry to your hair? I’m about to it, but I’m contemplating wet or dry hair…….. I tried this mask, but made a mistake. Don’t use it right after coloration! the hair is “open” and it’s impossible to wash correctly the mask after… was still greasy and sticky after 4 clarifying shampoo… You need to wait until the hair is back to normal after coloration to use this mask. Does this work on black hair (I’m from south africa, and I’m colourd, dnt knw what u guys call it, maybe african american) bt I do not have coars hair? So will this work? would this work in curly hair? Will my hair grow? Is it okay to use organic honey? The damp towel turns freezing cold after a few minutes…is this.ok?? Yep. You can put a plastic bag (grocery bag works fine) over it and this will trap some of the heat in. Usually I find even if the towel gets cold on the outside, it’s still warm wrapped around the hair so don’t worry too much. Even though it’s really sticky, do I massage it in and then brush it out? It shouldn’t be too sticky because of the olive oil. If it’s too sticky to brush, don’t force it because you’ll just pull on your hair. Just leave it in and then rinse it out as directed. I dyed my hair red a few weeks ago, will this make my colour fade? No. Red fades quite quickly no matter what, but this is a very mild hair mask that will not strip the hair color. Blend pumpkin and avacado in with that mixture. My granny thinks using honey and olive oil will make my hair go grey is that true?? And can i please know how often should use this mask? It’s not true, it won’t change the colour of your hair at all. Do you put it on wet, damp, or dry hair? damp or dry hair works! Did you know you can use honey on your face too? If you do it for 15 minutes every day your face will be flawless! It seems to make acne and blemishes disapear! Can u use this mask on your face? Do NOT use this in your bangs! Mine are absolutely DISGUSTING even after washing the honey and oil out TWICE. Yes, it makes your hair shiny and smooth but it makes bangs horribly greasy. To the point where they look wet with grease. EW. Just use shampoo, it will be fine. Did my whole head, including my bangs, and they came out swell. Super soft and shiny, not greasy at all! for those who tried it did ur hair color get a little lighter ? I love using this mask, I always use Active Manuka Honey with Coconut Oil and it works a treat for my damaged hair, love it! Will it bother dyed hair? So I tried it tonight & it made my hair 100% softer. Does it help your hair grow, also? It doesn’t change your hair color? I’ve heard and seen so many people using honey, olive oil, and cinnamon to lighten their hair and it works? Does it just depend how long you keep it in? I used extra virgin olive oil straight up today. I was feeling very unwell and stayed home from work, and decided today was the day to douse my head in the liquid gold. I massaged it into my scalp, which was very dry, and then wrapped an old towel around my head and kept it on for 7-8 ours while I read a book in my pjs. I just had a shower and I’m letting it air dry now. My hair has never been so soft!